A new musical extravaganza flies into the newly renamed The Other Palace for a limited season. 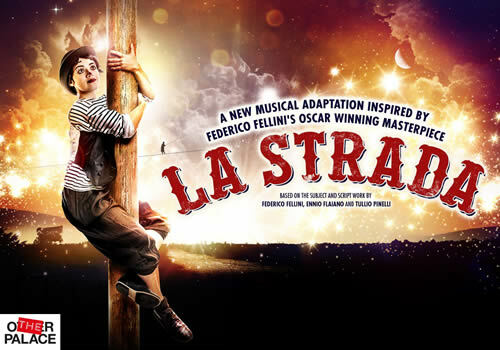 Based on the subject and script work by Federico Fellini, Ennio Flaiano and Tullio Pinelli, La Strada is the circus phenomenon that is set to dazzle the West End, with performances beginning May 30th 2017. One of the masterpieces of modern cinema, La Strada received an Academy Award in 1957, for the film starring Anthony Quinn. La Strada follows the innocent Gelsomina, who is sold by her poor mother to a circus strongman named Zampano. Together, the pair travel through the Italian countryside to earn their keep, performing at various travelling sideshows. When a dangerous trip leads them to a ragtag circus, they meet Il Matto, a tightrope walker who instils Gelsomina’s spirit with a touching confidence. La Strada comes to the stage in a passionate new stage production, featuring plenty of music and a hugely emotional story that is guaranteed to stir the soul. Performed by a multi-talented cast, this visual treat of a show is packed full of stunning effects and beautiful music. Casting includes Audrey Brisson as Gelsomina, Stuart Goodwin as Zampano and Bart Soroczynski as Il Matto, as well as Matt Costain, Fabrizio Matteini, Sofie Lyback, Teowa Vuong, Niv Petel, Niccolo Curradi, Tatiana Santini, Luke Potter, T J Holmes, Tim Dalling and Mike Akers. Directed by Sally Cookson, who received acclaim for Jane Eyre at the National Theatre, as well as Hetty Feather at the Duke of York’s, La Strada features swooping original music by Benji Bower, design by Katie Sykes, lighting by Aideen Malone and sound by Mike Beer. La Strada plays at The Other Palace from May 30th until July 8th 2017. La Strada is suitable for those aged 12 and up.